What is it about working as a hog roast caterer in Chelmsford that makes it so special? Well, for us it’s the fact that there’s a little bit of everything right on our doorstep. We love a bit of variety and that’s exactly what Chelmsford offers us. Variety is exactly what we give right back to the people here as well. We’ve certainly made a name for ourselves here and that’s just the way we like it. Whatever line of work you’re in, what you’re looking for is to become a winner. We’ve certainly found what we like to think is the winning combination. It looks like our customers think like that too which is why they keep coming back to us time and again. So what’s our secret? Well, it’s pretty simple really. We go out and find the best quality meat and other ingredients that happen to be out there. We then use our ‘kit’ and we get our highly trained catering staff to cook up and serve scrumptious hog roast feasts – the like of which you won’t beat. That kit happens to be the latest spit roasting equipment around. That’s right, we use the ancient method of spit roasting to really get the best out of those ingredients. Little wonder that when it comes to hog roast Chelmsford folk regard us as the place to go. 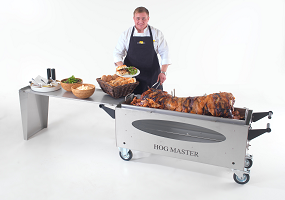 A hog roast is ideal for any sort of occasion you care to think of. Fortunately, we happen to be based in a county where celebrating comes as second nature! We don’t quite know what it is about the place that makes it like this. One thing’s for certain though; we’re certainly not complaining. Perhaps it’s the location? Being just a short tube or train journey from the Capital certainly doesn’t do any harm. There’s no shortage of great venues in Chelmsford for our many corporate customers who are looking to put on a bit of a show. This is where the versatility of our hog roast service really comes into it’s own. A customer may be looking to put on a day long presentation for prospective clients. What better way to round off a busy day than with a bit of a treat? Our hog roast not only tastes delicious, it’s a real spectacle too. Plus, what our customers get from us are truly outstanding levels of service – from our advisors who arrange everything, right through to the waiting staff who make sure everyone’s properly looked after. Creating the right image is vital and we make sure that our customers’ guests go away fully satisfied. For us as experts in hog roast, Chelmsford gives us everything we need to be able to show off our talents. From our experience, it’s the food itself that really gets people interested. There’s something about it that draws people in. This is probably the main reason why our hog roast hire Chelmsford service is becoming so popular. The idea behind it is simplicity itself. There’s a certain type of person who wants to have a go himself. We let our customers do this. We supply the spit roast equipment and we show our customer how to use it. We can supply the meat if they like but that’s entirely up to them. We then let our customers get on with it. This winning formula has turned out to be perfect for all sorts of events here in Chelmsford – whether it’s a simple family party in the back garden or perhaps something a little more grand. What’s more, if a customer’s looking to hire the equipment over a long period, we have some very attractive deals on offer. A pub for instance might want to set up a spit roast to give their customers a tasty treat throughout the summer. Our facilities certainly provide a talking point in the beer garden! When it comes to hog roast hire Chelmsford people have really taken us to their hearts. For many events and for many of our customers here in Chelmsford, ‘doing it yourself’ isn’t really what they’re after. Very often customers simply want to sit back and let us do all the running. After all – great service isn’t just for city gents. Whatever the celebration, we work very closely with our customers to make the day truly memorable. Whether it’s a party, a wedding or conference and no matter how many people are going to be there, we’ve got a menu option that will suit all tastes and all pockets. Little wonder that we’re the ‘go to guys’ for hog roast in Chelmsford.